From 1881 onwards many Jews left Russia and Eastern Europe, fleeing from persecution and violence. Around 120,000 of these people settled in Great Britain. Certain groups of people were not happy about this wave of immigration. 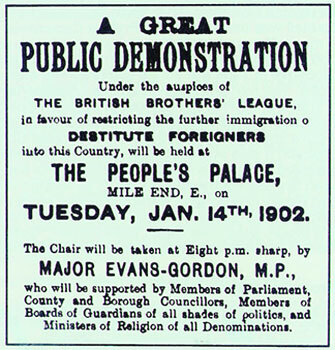 Protests were organized and this led to the Alien’s Act 1905 which was largely designed to curb Jewish immigration. This image is of a poster by the British Brothers League from 1902. The group aimed to stop poor Jewish people from entering the country.